One-touch passing is a difficult skill to learn and requires lots of practice. However, the reward is that the quicker your team can move the ball, the better chance it will have of slicing open opposition defences. Have an open body stance, belly button facing the target and their bodies over ball. Have the non-kicking foot alongside the ball, the inside of the kicking foot at a right angle to it. Follow through the ball’s horizontal mid-line. Use the correct pace so a team mate can pass first time. Know where next pass is heading before the ball reaches them. Split your squad into pairs and use one ball between each pair. Players, in pairs, stand five yards apart and pass the ball using one-touch to each other. Repeat, but this time, challenge players to see which pair can complete 20 passes first. 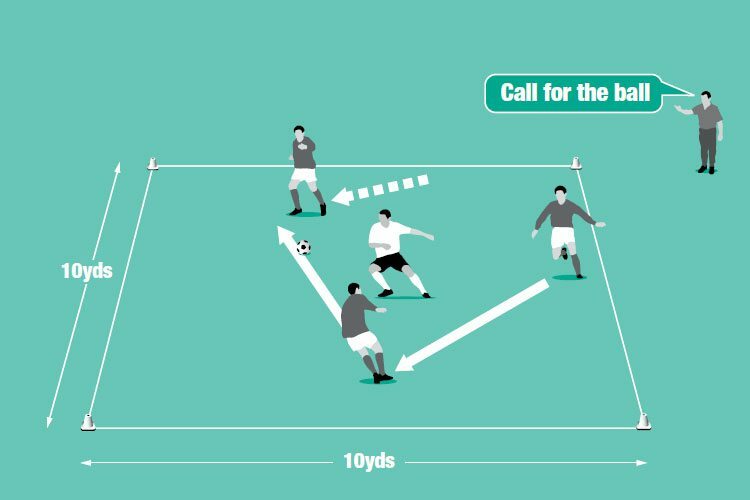 Repeat drill (1), but this time after completing a pass each player takes a step back until they are 10 yards apart, then take a step forward until they are only three yards apart. Remember, with all drills let the players start with two-touch if necessary to let them become comfortable before moving on to one-touch. Players use one – touch passing and gradually move away from each other to make passing more difficult. Play 3v1 “keep ball” in a 10-yard square, as in the middle picture. Begin with a passive defender, who applies pressure but does not challenge for the ball. Be sure to rotate players so everyone has been the defender. To progress, attackers score a point for five consecutive passes, while the defender scores a point for winning the ball or when it goes out of play. To progress further, increase the number of consecutive passes the attackers must complete successfully. Play 3v1 “keep ball” using one-touch passing. The defender applies pressure to win the ball or force a mistake. Play a game of 3v3 in an area with no goals, as shown in the bottom picture. There are no restrictions on how many touches each player can take to start with – however, the first team to make 10 successful one-touch passes wins the game. If the ball goes out of the area, play restarts with the team which did not lose the ball. Play 3v3 and the team which makes most consecutive one-touch passes wins.